7 Conversion Rate Optimisation Tools – Take Your Pick! Conversion rate optimisation, or CRO, is something I am very passionate about, and use here at Crucial. If you have not heard of it before, to simplify it, it’s the method of using analytics and user feedback to improve the performance of your website. You can use CRO to improve any key performance indicators on your page, support acquiring new customers, and ensure a higher performing website. You main objective in CRO is to increase the number of website visitors or passive browsers into valuable conversions. Conversion rate optimisation tools can actually figure out what users are looking for when they visit your page, and then it can help you give them just that. Depending on the KPI you’re looking to improve, CRO can mirror many different methods and tactics. It can be anything from making your call-to-action more apparent, placing it on an under-optimised page with proper traffic, to removing or relocating unnecessarily or time-consuming steps from your sales funnel. Performance marketers usually use CRO to improve clicks on an offer, open rates of an email, increase download rates of a certain app, increase the number of purchases in a store, and so on. They determine and measure these actions, and then use this useful data to optimise outcomes, as any improvement can generate a huge return in fairly near future. This is why CRO quite lucrative a practice for both big and small businesses worldwide. 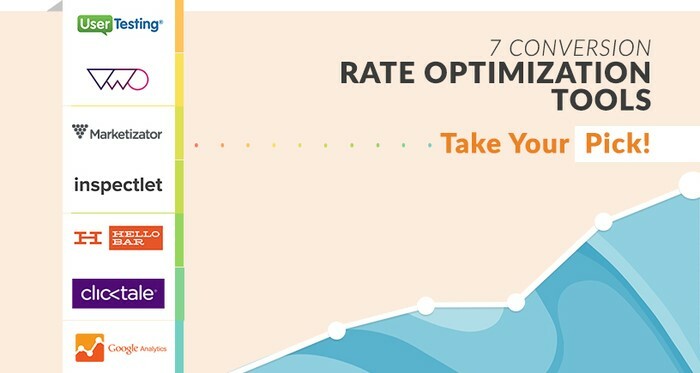 So, let’s take a closer look at these 7 useful conversion rate optimisation tools we think would be rather beneficial for your business. With this CRO tool you can select your target audience from the interface, then have this specific demographic complete a task on your site. The visitor can record themselves (video and audio) so you can then watch the videos and use their feedback to figure out the issues with your website. Your own intuition is useful and can be a deal-maker, but getting real feedback from your users can indeed be a crucial part of the CRO processes. Although recording videos of users can be a slow process and isn’t quite a scalable means of data collection, just a couple of these can provide valuable insights into what is and isn’t hot on your page. With VWO editor you can edit, modify, and remove certain elements on your site, while you can also examine and analyse images, designs, and web-forms. Once the testing is complete, you will be provided with the results on which test won, so you can make direct changes onto your webpage. The great thing about Visual Website Optimizer is that it is free for up to 1,000 visitors and it lets you control your testing without relying upon your developer. The tool allows you to install codes and then you can make changes directly from the interface, while you can also define what types of visitors see certain tests. The thing that separates Marketizator from the other tools is the fact that it does more than just A/B testing. Receiving qualitative data is paramount and this product helps you gather rather vital information pretty easily. I also like the personalisation aspect of the technology. Marketizator excels with its easy to use interface, effective conversion rate optimisation tools, A/B Testing, Surveys, Personalisation, WYSIWYG editor, ready-made templates, segmentation, reports and dashboards. The creators of this tool seem to know where the market is going, but still manage to base the product on simple A/B testing. This user-friendly tool relies on users’ intuition as it gets out of the way in order to let the user do what they want. It covers their basic needs, while the simple funnel analysis and filtering options is a walk in the park with Inspectlet. However, this CRO tool does have a several minor flaws as it lacks some of the newer features like watching live recordings, live chatting, surveys, and polls. Hellobar is one of the simplest optimisation tools out there, but this doesn’t make it the worst one. It displays a visible bar that sits at the top of a web page so it will to draw the attention of your visitor, but it primarily acts as a website call-to-action. You have the option of including Hellobar on one page, several pages, or pin it onto your entire webpage. Oh, yeah – and it’s free. ClickTale is a full-fledged analytics package that is pretty hard to match. The plethora of features and possibilities this tool provides will require a dedicated professional to get the most out of this CRO suite, so if you merely starting out with CRO, this might not be the right choice for you. As ClickTale is perhaps the most serious and mature tool on our list, its creators have taken several steps to make it stand out from the crowd. It provides a separate side-service only for tracking mobile users; integration with partners that lets you dwell into your Optimizely A/B tests or Omniture segments and cookies; it lets you reuse the reports and segments of Google Analytics, Omniture, etc, while it can also bounce reports. The Clicktale suite is free for up to 5,000 visitors. Even though we put this tool at the end of our article, Google Analytics is currently the most popular web analytics tool around the globe. This suite allows you to track website behaviour and reports on visitors, engagement, traffic sources, content, and e-commerce sales. It is user-friendly, intuitive and most importantly, it can help you identify your most profitable marketing channels. Another excellent extension of Google Analytics is Google Analytics Content Experiments that provides you with the opportunity to test different variations of a landing page to see which of the version is achieving best metrics. Google content experiments allow you to test as many as five different versions of the landing page, while some of the useful features include the ability to select what percentage of visitors will be included in your optimisation experiment and the opportunity to receive email updates about the progress of your experiment. Have another tool you love using for CRO? Let us know!